Sending money to friends and family through services like PayPal and Venmo is great, but depending on how you pay, these companies take a cut from your payment. This means you’ve either got to pay a little extra or your recipient doesn’t get the full amount you owe them. Square Cash wants to change that. It’s a peer-to-peer money transfer app that deposits cash directly into your bank account without charging any fees. That means there’s no need to log into the app and request a bank transfer! Square Cash also includes some other great features, including cashtags and the ability to send money via email. Will our guide convince you to add Square Cash to your list of must-have apps? Let’s find out. Square Cash comes from the same company that brought us Square credit card swipes. You’ve probably seen these white, square card readers at some of your favorite coffee shops or local stores; they’re popular among small businesses because they turn iPads into cash registers. If you’ve ever been in a dealer’s room at a convention, you’ve definitely seen Square credit card swipes in action! Square Cash is different than the Square credit card reader, though. It’s designed to help you transfer money from person to person for free, without swiping a credit card. When you set up a Square Cash account for your small business, Square takes a 1.9% cut of each transaction; when you set up a personal account, the transactions are free and you get to keep all the money you receive. First, I went to the Square Cash website. I started the account process by entering my phone number. Square Cash texted me a confirmation code, which I used to confirm that this was in fact my phone number. You can also enter your email address, and Square Cash will email you a confirmation code. I linked my debit card to my Square Cash account, and then Square gave me my personal cashtag, which is like an account nickname. Mine’s $NicoleDieker, for example. When people want to send you money via Square Cash, all they have to do is type in your cashtag and it’ll get to you — but we’ll discuss Square Cash transfers more thoroughly in a minute. The last step was to download the Square Cash app to my phone, which only took a few minutes. Once you get set up, Square gives you the opportunity to invite your contacts to try Square Cash, and you’ll both get $5 if your friends sign up. Consider it a quick way to make a few extra dollars! 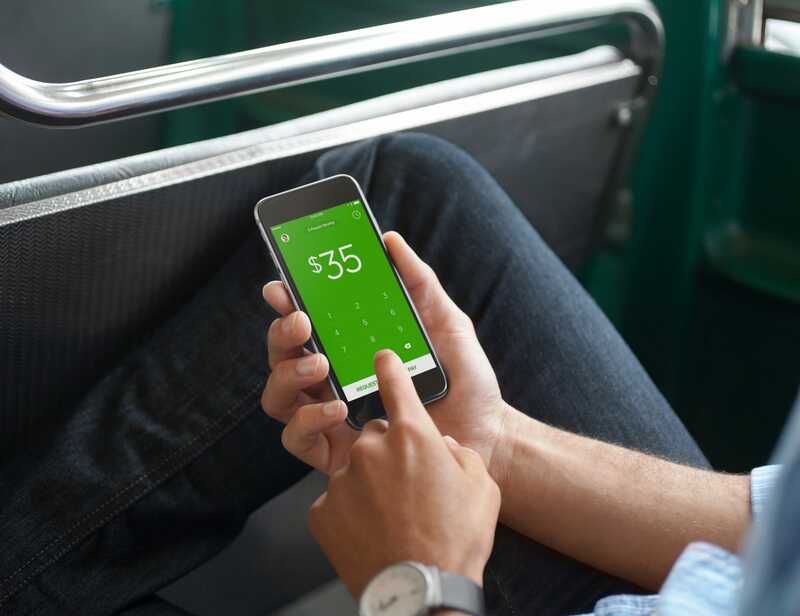 Square Cash offers three easy ways to transfer money to friends. First, you can do it through the app. I recently used Square Cash to treat a long-distance friend to lunch, for example. I opened up the app, typed in the amount, hit pay, and then entered my friend’s name. Square Cash automatically pulls from your phone’s address book to send the money via email or text message. If your friend has a cashtag, you can skip the address book step and type in the cashtag instead. If your friend has already linked a debit card to Square Cash, the funds will be transferred automatically. But you can send money to any friend or relative, regardless of whether they have a Square Cash app on their phone, and Square will invite them to link their debit card so they can receive their funds. You can also transfer money via email without using the Square Cash app. Open a new message, and put the cash recipient in the To: field and [email protected] in the CC: field. Put the amount you want to send in the subject line (like “$15”) and add an explanation in the body of the email (like “thanks for covering me at dinner!”). Then hit send. If you’re sending cash to someone who doesn’t have a Square Cash account, consider sending a follow-up email or text to let your friend know that you just sent them money. If they aren’t already familiar with Square Cash, they might not trust the site — so send the follow-up to let them know Square Cash is for real! Lastly, if your friend has a cashtag, you can transfer money by visiting your friend’s cashtag page (it’s cash.me/ followed by their cashtag, like cash.me/$NicoleDieker) and entering the amount you want to transfer. You can even transfer money through a cashtag page without having a Square Cash account; just input your debit card number like any other type of online payment. You can receive money through Square Cash when people choose to send it to you — like my choosing to treat my friend to lunch — but you can also use Square Cash to request money from family or friends. Let’s say you and a friend want to go together on a wedding gift, and you’re the one who goes to the registry and makes the purchase. You can use Square Cash to let your friend know how much money he or she owes you. Requesting money through the Square Cash app is kind of like sending a mini-invoice. Type in the amount requested, hit “request” and add a contact. Type in the reason why your friend owes you money, then send your request on its way! You can also request cash via email. It’s the same as sending cash via email, except this time you put [email protected] in the CC: field. Put the amount requested in the subject line, add an explanation in the body, and hit send. If you receive a Square Cash request from someone, don’t worry — money isn’t going to magically disappear from your bank account. When you receive a Square Cash request, you get to decide whether to approve it. If you don’t approve the request, no money changes hands. The money you receive is deposited directly into your bank account. Other tools, like PayPal, hold your money until you log in and request a bank transfer. Square deposits funds into your account within one to two business days. No fees. PayPal charges a fee every time you receive money. Venmo charges a fee if you pay via credit card or “non-major debit card,” but receiving money is always free. Square does not charge fees for personal cash transactions. With cashtags, sending and receiving money becomes super easy. It’s already easy to send and receive money with Square Cash, but the cashtag system makes it even easier. You can send money to people even if they don’t have a Square Cash account. No need to email someone and ask “what’s your account name?” Just use Square Cash to send them money and Square will take care of the rest. Square Cash requires two-factor authentication at login (that’s where they send you a code as part of the login process), to confirm you are the real owner of your Square Cash account. This is one layer of protection from hackers and from people who may accidentally gain access to your phone or your Square Cash account, but you can also go into your Square Cash account settings and set them to “security lock,” which requires you to enter your debit card’s three-digit CVV number before you can send cash to other people. Another important step: Don’t forget to log out of your account or app after every use! Check out Square Cash and see if it works for you. With its no-fee personal transactions and easy-to-understand interface, it might be your new favorite app! Your Turn: Have you ever used Square Cash to send or receive money? Sponsorship Disclosure: A huge thanks to Square Cash for working with us to bring you this content. It’s rare that we have the opportunity to share something so awesome and get paid for it!